Mom and Baby Beluga Whale is a new painting for my Heni’s Happy Paintings Etsy Shop. I wanted to do a new sea life painting with a mom and baby. It’s been fun to paint the two whales and figure out how to bring in the light through the water. I was the girl scout leader for my girl’s troop through her fifth grade, our big end of the year event was a sleep over at the Atlanta Aquarium which had recently opened. The girls were thrilled. We got the “behind the scenes” tour and to do lots of fun activities through the night. My favorite spot was by the window with a view into the large Beluga Whale tank. There were two whales that would swim by and look at us. They are graceful and seemed very gentle and curious about our kids. Later in the night we set up our sleeping bags in the river otter section which was something, they came alive at night calling each other and diving in and out of the water. It was great fun to watch, though we didn’t get any sleep. In this painting the Beluga Whales are free and not in captivity. Recently the Georgia Aquarium has decided to no longer will take whales or dolphins caught in the wild, they need to be with larger family groups and able to swim free. Times are changing as we become more aware. One of my goals for the new year was to begin a daily practice of making art. I’ve started sketching more and I try to have a painting on my easel most of the time. Here is a still life I recently completed, Lemons. When I first started painting years ago, I painted several pears in this blue bowl. It’s helpful to start a painting from a real scene, you can focus on what you see, how the light effects the colors of the objects. I felt it would be a good exercise to do some still lifes where I could actually see what I am painting. I chose lemons this time around as lemons are one of my favorite fruits. I use them daily to make marinaded salads and add them to tea. Their bight cheerful yellow color seems to match this time of year when everything is waking up. It was a fun challenge and I am fairly pleased. In keeping with my goal, I’ve stared sketching a scene for a new painting, another still life. These past few weeks I’ve been trying to look at my own shadow. It has been painful but I’m feeling stronger now, more centered. I wanted to do a painting about the shadow and the light that comes from releasing our fears. There Goes My Shadow is the result. Here in Atlanta the kids have been back in school for three weeks now. My daughter is in her senior year of high school and will soon begin applying to colleges. With the realization of the expenses that lie ahead, my husband and I are trying to figure out the various financial options of her potential college choices. 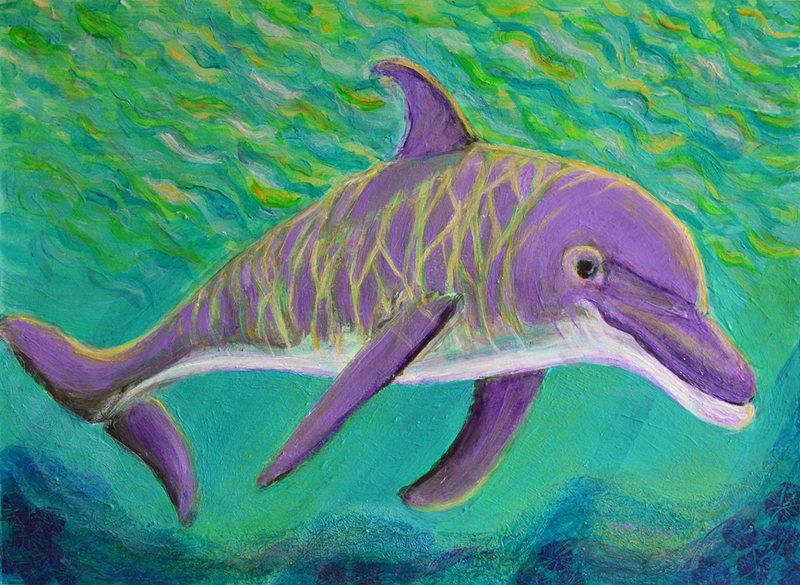 It’s overwhelming; so, early this week when I received a message on my Heni’s Happy Painting’s Etsy Shop from a woman who loved my Mom and Bay Dolphin print but wanted a single dolphin instead, it was the perfect time to step back from that stress and dive into a new painting. Dolphin in the Dappled Sunlight is the result. I’ve always loved dolphins, they are so playful. When we were in Hawaii swimming with them, the beauty of the light through the clear blue water reflecting on their bodies was striking. I tried to capture that light and yet make it slightly different from the other painting. I am hoping the woman will be pleased. Enjoy these last days of the season! 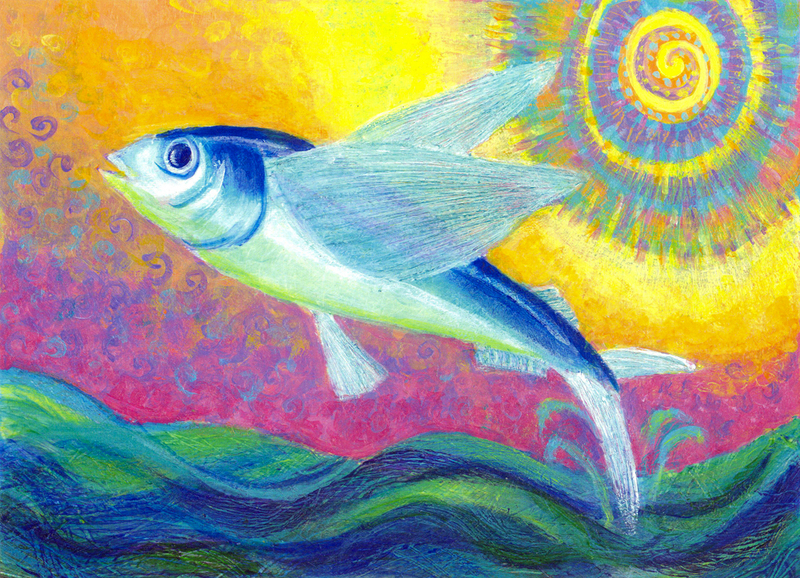 Here is my most recent painting – Flying Fish. I have painted many a fish and always swimming in the watery depths. I think of fish as being one with the water where they flow and move in tune with the currents. As I child I was very sensitive to the feelings and emotions of others. I can remember my mom telling me over and over that I was too sensitive. It always bothered me when she told me that, but she was right. 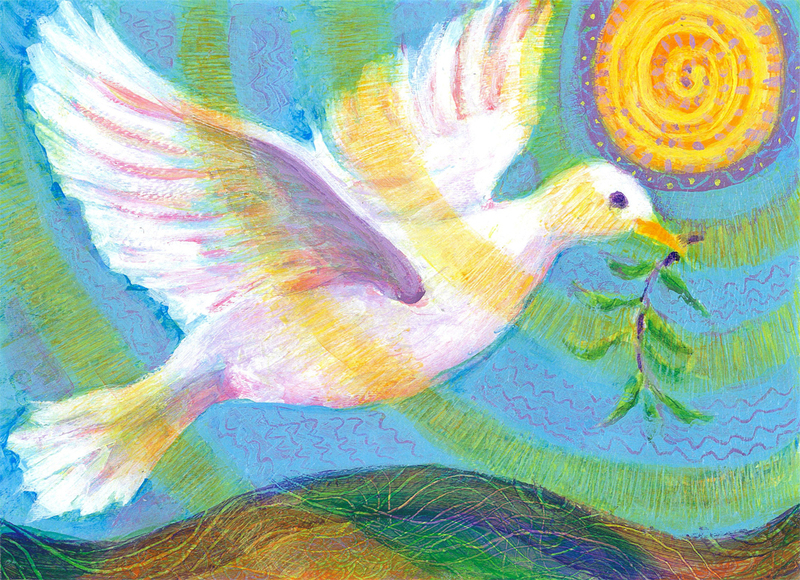 Through the years I’ve learned to develop more boundaries and separate from others’ emotions. I’ve become less moody and more objective. I wanted to paint a fish who could enjoy flying up in the fresh air with the warm sun. I worked on this painting for over two weeks, it took a while to come together. I knew I wanted a fish in the sky with the sun but working out the colors and shape of the sun and sky was quite a challenge for me. I’m pleased with the result and feel the fish is happy getting a bit of fresh air before diving down again into the depths.